Furniture pads aren’t just for floors – they can save your walls too. See that mirror decor in the picture laying flat against that nicely painted wall? None of us want that. So how do you protect your home (not to mention the back of the frame or decor) against scratches, marks, and dents? Place 4 super cushiony Furniture Buffers non-slip furniture pads across the back. These pads are a rubber foam material so they’ll not only put a physical layer of protection but they’ll also soften any blows. For example, let’s say you have a large piece of art hanging in your living room and you take it down to dust it. Well the artwork is heavier than you remember and the top accidentally bangs back up against the structure when you try to take it down – these little sticky miracles will absorb a lot of the shock and make the slam not such a big deal. Does that artwork above your sofa look beautiful? Of course, but you need to invest in safety and precaution to protect your home and your furnishings. The wonderful part is for less than $10, you can safeguard any decor on your wall: mirrors, picture frames, artwork, etc. All you need is 4 buffers for each piece. 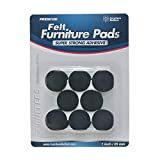 Can you use felt furniture pads too? Yes! Felt definitely works but the reason we advocate you use the rubber-foam non-slip pads for cushioning is because they have more give to them and thus provide more of a shock absorption and flexibility element. What if you need more separation between your wall and your frame/decor? You can easily double stack Furniture Buffers furniture pads by sticking one on top of another. Because they’re extremely sticky you won’t have to worry about them coming apart. And, of course, you get the end benefit of creating a larger space between the inner linings of your home and whatever’s resting against them. At approximately .1 inches thick or depth, you can incrementally stack until you come up with the perfect separation distance. One more thing to consider is these foam cushions are black so they’ll hide in the shadows and go unnoticed. 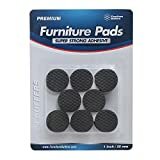 Click here to grab a pack of Furniture Buffers from Amazon now. Don’t stop at protecting against chips and scrapes on paint and wallpaper, see how Furniture Buffers Jumbo Pack of felt pads can protect all of your hard floors.